This Choice 24 oz. insulated stainless steel server is perfect for your coffee and beverage serving needs! Looking for a container that provides easy dispensing, a sleek appearance, and temperature retention? This unit is made of durable stainless steel and features a double wall construction to give you excellent temperature retention, keeping your drinks at safe serving temperatures. I have been using these handy little carafes for different types of cream. It works great for me because it is insulated. I pour the cream into the carafe and set it in the fridge until its time to serve. It gets nice and chilled but then it STAYS chilled for the entire couple of hours that we serve coffee and tea. This is so wonderful because I can leave the cream out on the serving table without having to worry that it will get too warm or go bad. I love these ...and one other note....one of mine came damaged and webstaurant sent me a new one right away with excellent customer service. I would definitely recommend these to a friend and I would buy them again. They work, they're convenient, and they're not too big (space saver). Love it! We purchased a few of these insulated carafes and are really pleased with them. We use them to keep our milk and creamers cold for our breakfast and lunch service and are happy with the results. Highly recommend! Great, easy to use insulated carafe that we use to keep half and half cool for long periods of time. The cap twists off and is easy to refill. Decent little carafe. Holds enough half and half to get me thru a busy morning. Spout is not easy to clean at all. Still, a good purchase. Great little Stainless Steel Insulated Carafe/Server! I use these as milk pourers for a food service shop. Not too big or heavy, so very easy for people to use, holds a great amount of milk/liquid, while keeping it cold, and not too big, so that you can refill during the day, to always make sure that the milk is still cold and safe to serve. We use this product for keeping our coffee creamers during breakfast hours. We store it overnight in the freezer and it is ready to do the job the next morning! We use this for half and half everyday for our coffee service. You do need to soak it and clean the top well to get it completely clean, other than that, it's perfect. So that was the tipping point to the Thermos but honestly, in the end, I'm so glad b/c the color of this jar is SO beautiful. But more to the point, it has kept my soup HOT 4-5 hours later and not one drop of it is leaked into my bag. This is a great insulated Carafe. The price was great and it has held up well over the past year. We use them for our Coffee bars on catering jobs. This is a good carafe for slow days when we don’t serve as much hot coffee. We toss the contents at the end of the day so there isn’t as much waste when using a small unit. Keeps cold. Stays cold for a very long time between 6 and 8 hours. Great for different types of milks and creamers for a coffee station or buffet. Inexpensive and durable carafe. I use to serve creamer with coffee. People very easily figure out that they have to unscrew it for it to pour out creamer. I would recommend it - keeps cream cold for hours. We purchased 2 of these carafes. We keep them in the fridge overnight, fill them with cold product & the contents remain cold for roughly 8 hours. Great value for the money. If I could change one thing about them, I would like to know that you could pick them up & pour. Instead, you must unscrew the cap a bit to get the liquid flowing. This is somewhat annoying, however we don't serve a boatload of coffee, so we can assist our guests. We are so glad we switched to these Stainless Steel Insulated Carafes. We started with plastic, and all it took was a couple drops from butter finger employees, and one dish washing cycle to destroy the plastic carafes. Stainless steel is the way to go, enough said. These are so inexpensive, and work great for offering different creamer options to our customers at our coffee shop. We write on them with chalkboard pens, so the customer knows why type of milk or non-milk creamer is in them. They hold up very well to lots of use. I bought this pitcher for some of our black coffee drinkers to leave on the table. 24 oz isn't a lot but works great for one or two people. We ordered this carafe for our coffee station. It’s size is perfect and it’s sleek design takes up very little space. Easy to clean and good material. We use this for our almond milk and it is awesome. It keeps the milk cold and is really easy to use and clean. The only warning I will give is to make sure you really take apart all of the components when you clean it. Great stainless steel insulated carafe. We use these on our self serve coffee condiment table. They keep milk and cream cold for hours. Very easy for customers to use. We highly recommend the insulated carafe. We use it to keep the milk and creamer for coffee at the right temperature for long periods of time. It works very well. 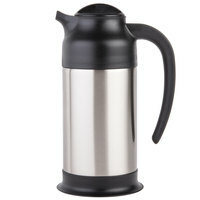 An awesome 24 ounce stainless steel insulated carafe that is great for keeping our coffee creamer warm at our brunches. The carafe is amazing and does well with both hot and cold liquids. I think this carafe works great. My only complaint would be how much you have to unscrew the cap before you can actually start pouring the milk from it. I'm afraid that one day the cap is going to just come off and spill everywhere. This carafe is great!! When I have family over, I fill this with decaf to have on hand while regular coffee is brewing. It keeps your beverage warm and it is easy to clean! This insulated carafe is a great choice! It's easy to clean, the lid pops off smoothly, and the handle is comfortable. Our customers love it! Was looking all over the place for these insulated carafes. I needed them quickly for my cafe and found them to be expensive everywhere except here. These work perfect for keeping my milk and creamers cool on the counter. They do the job however, the lid makes pouring a little confusing. I've seen customers fumble with it as they turn the knob left and right trying to get some milk out. Also, cleaning the spout is fairly difficult. This server does a great job of keeping liquids cold! We use them for our milks and haven't had any issues with the temperature. The only issue is it's not easily cleaned and requires long periods of soaking to get it completely clean. We use this for cold items. Works well, but it is a bit difficult to keep clean. Good price though and well worth it. This pot is sleek and looks great for catering and service. It keeps things cold for hours and is easy to use and clean. Works perfectly for our new Welcome Center! Fits in our mini-fridge and is convenient for everyone. Guests love having options for their coffee/tea needs! Would highly recommend this to anyone! Great size, great price. We've found that it can't be left out at room temperature for long. We store in our cold storage & provide to customers, but can't leave it out. Still us it & happy with it as a dispenser. My customers are like my dogs: independent. They like to serve themselves and control their own portions, especially when it comes to their coffee. That's why I always make sure to have one of these filled and ready to go! Don't buy this! It is impossible to clean even after one use. liquid gets trapped between the layers and sits in there. I had to throw these out after using, and attempting to soak them for a week to get the smell out. Thank you for your review on this carafe! We are sorry about the difficulty you've experienced with these. A Customer Solutions Representative will contact you shortly to resolve the issue. These are really great at keeping liquid at the right temperature for several hours. The only issue I have is the spout is a little hard to clean, I had to find a brush to clean it better. This product is probably ok if you are running a dainty and careful coffee house for careful people. The plastic is brittle, and one little bang against a table top, and the bottom plastic chipped off. But I guess if you have a cute dainty coffee house, you order a prettier container. So, I guess I can't fully recommend this product. It does keep things cold. But the plastic is not up to par. This product is a must have. It keeps liquid at temp for several hours. We have several of these. Clean up is also very easy. I was so happy to fing these. The match the airpots, they are the perfect size, they work well for keeping things cold and they are a great price. A nice little carafe to use for our coffee service. Sometimes hard to clean the spout. Keeps things for a long time, though, especially when the unit is pre-chilled. this little gem is bullet proof. keeps things chilled and safe for a long time. we use a few of them daily and are happy with the functionality. We were able to save a lot of money buying online rather than normal purchasing routes. We use these for holding our drink on our coffee breaks and they work great. They work well but I find that they don't clean all that great. After a week or two of use I was finding they weren't sterilizing properly because of how the inner portion of the pouring spout is shaped. But it could just be me! We are still using these. The bottoms have chipped off but im sure that happens in time. But other than that it is still going strong. The 24 oz stainless steel carafe was priced right and works perfect for keeping liquid cold. Attractive and clean looking, much better than the plastic versions. I bought 2 of these and leave out on my coffee bar. They keep my drinks cold for about 6 to 8 hours a day and look nice too! Carafe works. We have had three of these for a while and they hold up well - no scratches, chips, or dents despite continuous use and washing. This insulated dispenser keeps cold for hours. After washing it out at the end of the day, I put it in the freezer overnight so it stays even colder when you add the drink. Works well and keep liquid cold. I just wish customers would not feel the need to turn the top! The spout is set to pour at 12:00 and 6:00. When customers turn it too much the liquid leaks out the threads and not the spout. Not a problem with the product--just customers need to "fiddle" with it! This is a great carafe and it keeps my drink cold on the counter and it's easy for my customers coffee they love it too because it's so nice to use and it works great! We recently bought on of these for use around our shop and it has worked like a charm. The best part though was the price. What a deal! This is another way of providing a better quality for coffee drinkers. I have seen restaurants use it's original carton boxes for drinks. The price aint expensive. These stainless steel carafes are good for coffee houses! A very professional presented design is great for using in any dining room! Stainless steel keeps drinks colder longer! We needed a low cost option for back up drinks. These look nice, are durable, and keep the condiments cold! These are great for either keeping your hot beverages hot for a long period of time or your cold beverages cold. The large size is very handy for parties. This insulated thermos keeps drink cold for several hours. It is easy to wash and looks nice on the counter. We have had ours for over 1 year and it shows very little wear. This 24oz insulated carafe has been a part of many coffee shops. A good choice for a good price. Easy to clean and very durable. Purchased this for use at church dinners. Worked very well and was a beautiful addition to our beverage table. Will enjoying using it for many years. Just the right size for my fetco and not too hard to dispense out of once the coffee starts to get low. I shopped around a lot, and with shipping this was the best price I could find. An attractive piece we added to complement our catering coffee service. Looks sharp and keeps the product at the right temperature for hours. Just don't lose the cap!